MR16 is the designation for a multifaceted reflector (MR) light bulb which has multiple small facets. LED MR16 bulbs come in a variety of base configurations, the most common ones being GU5.3,GX5.3, GU7, GU10 and BA15d. LED MR16 bulbs are commonly available in a range of color temperatures from 2700 Kelvin to 7000 Kelvin. LED MR16 bulbs come in a variety of beam spreads denoted by the following: VNSP (very narrow spot): less than 8 degrees, NSP (narrow spot): 8-15 degrees, SP (spot): 8-20 degrees, NFL (narrow flood): 24-30 degrees, FL (flood): 35-40 degrees, WFL (wide flood): 55-60 degrees, VWFL (very wide flood): 60 degrees or more. 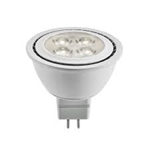 6.6MR16-F35-3000-DIM-12V Philips 457606 - Philips LED MR16 25,000 Hour Average Rated Life 3000K Color Temperature 35 Degree Beam Spread 395 Lumens. 6.6 Watt, 12 Volt. This Lamp is Dimmable.